Afriend of mine who lives in Italy gave me an Italian cooking book as a wedding present (that's almost 11 years ago!!!) Flipping through the pages recently in search for new ideas, I realized how little I knew about authentic Italian cuisine beyond the not-so-Italian dishes that are served here (or in France). It led me to wonder about Spanish food. When it comes to Spanish cuisine, I was even more ignorant beyond the tapas, churrios, paella and jamon iberico.... . Strange in a way when you realize that Italy and Spain border France but despite this geographic proximity developed very different cuisines. One of the spices I wrongly-I-suppose (90% of the world production apparently comes from Iran although in the US, I was surprised to learn that it is still produced in the Dutch Lancaster county (about 2hrs away from Philadephia)) associate with Spain is saffron. My mother used to have tiny tiny red boxes of saffron when we were kids and I remember loving to play with them...(as part of my love to reorganize the spices box!!) but I never realized the value of these boxes until as adult I had to face the shocking price of saffron. Tiny treasure boxes as saffron is indeed one of the most (if not the most) expensive spice in the world! 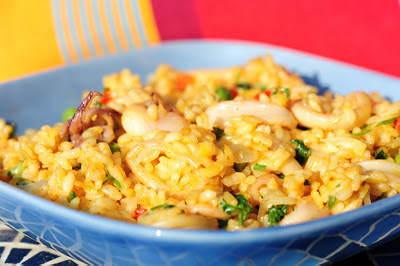 I generally cook saffron with seafood and rice (like we do in the South of France in the fish-soup Bouillabaisse) and since I have been trying to serve different seafood to my family recently, I thought that it would be a great idea to use squid instead of white fish in this dish. I served it to my family the other day and my husband compared it to a Spanish paella (which he enjoys more than a risotto) explaining to our children what paella is really about, where it is eaten, what saffron is about, etc.. Yet the kids were more intrigued by the squid (I had asked to have tentacles as well as the head!!) which led us to talk about these little sea creatures too!! To be honnest, this dish has nothing to do with a paella (no chicken, no shrimp, no mussels, no tomatoes) but yet again, there must be a few different paella recipes in Spain! So why not? All that I know is that we all loved it and I know that I can now put it on the list of dishes that I know will score high with my family. So if you can afford it, purchase a little bit of saffron and try it out. You won't be financially richer but you will be culinary-wise...a little bit of Spain in your home. Because no matter how long I live in Philadelphia, I will have a hard time associating Saffron with the nearby Dutch county! Bon Appétit! Bring to a boil and then simmer until rice is fully cooked, stirring often and adding extra liquid if needed. There are definitively different grade/quality of Saffron. I purchase the small Spanish Saffron from Trader Joe's. It might not be the best Saffron ever but it suits my needs and budget.